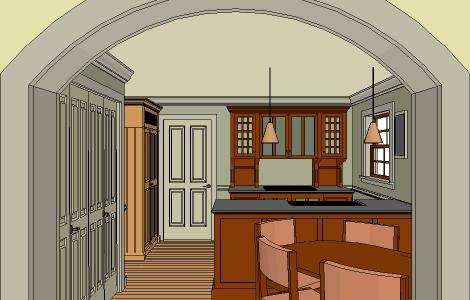 The following article graphically shows some Kitchen Design Ideas for Small to Medium sized kitchens that are furnished with our Workstations. A Picture is worth a thousand words, and this is especially true when trying to describe a furnished kitchen. 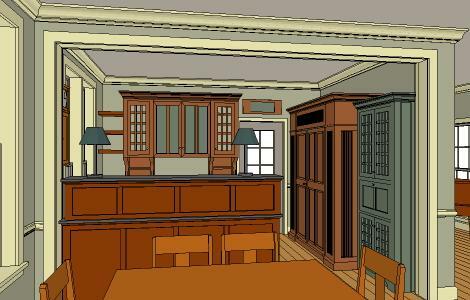 The following collection of renderings have been created with our 3-D design software that we use in the preliminary design stage of our projects. 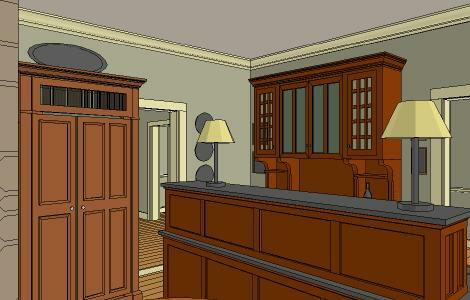 The images show the locations and sizes of workstations, but do not show the actual features of the individual pieces. 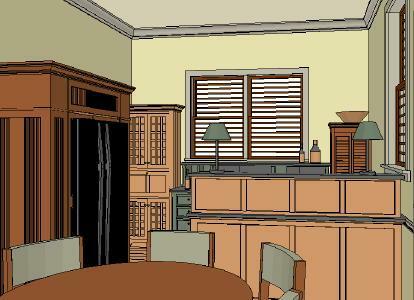 The YesterTec Designer’s catalog is required to select the style, wood type, stain or paint colors, door and drawer styles, countertop materials, interior options, etc. You will see many images that do not show exposed ovens. That is because YesterTec’s U.L. Listed technology allows the ‘hot’ appliances to be concealed when they are not being used. Though most cabinet manufacturers have been concealing refrigerators and dishwashers for decades, YesterTec is still the only manufacturer that has a U.L. approval to conceal the ‘hot’ appliances. 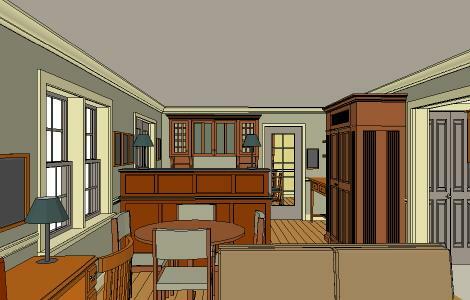 These renderings are very popular with our clients since each design can be endlessly modified and viewed from any angle while still in the design phase. Once the layout is approved, the pieces are styled and priced from the pre-priced choices in the YesterTec designer’s catalog and the design phase is done. Simple…Fast…Fun. First of all, lets compare the difference between a standard kitchen/family room and the same room furnished with Kitchen Workstation Furniture. 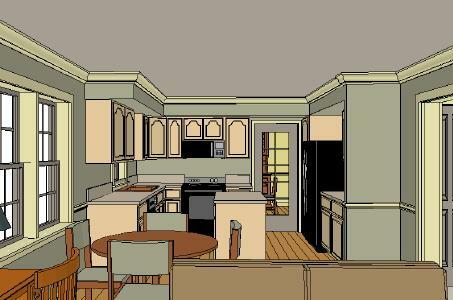 Here is an example of a typical family room/ kitchen designed with standard inline cabinetry.Notice the continuous cabinetry and countertops, all one color, and the appliances that are exposed to the living area. Note the small window above the sink and the soffits and wing walls interrupting the room’s lines. 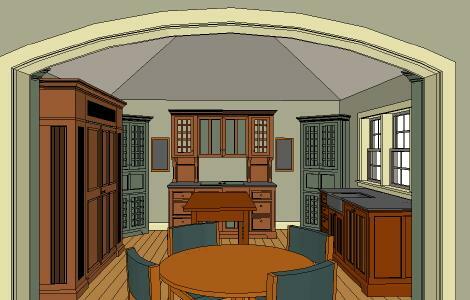 Here is the same room as above but furnished with workstations. Note that the messy counter tops are concealed and a large sliding door replaces the tiny window over the sink. There are no appliances exposed to the living area. The crown molding, floor and wall surfaces flow uninterrupted throughout the room with nosoffits and wing walls to disturb the room’s lines. 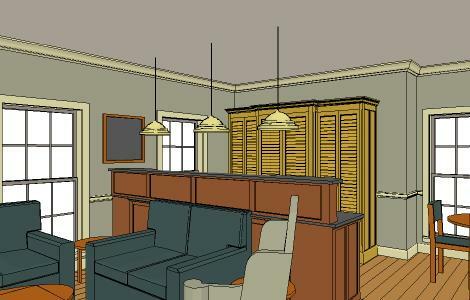 Note that each piece is proportional and balanced, similar to each piece of furniture in the living area. Next, lets start with our smallest kitchen. 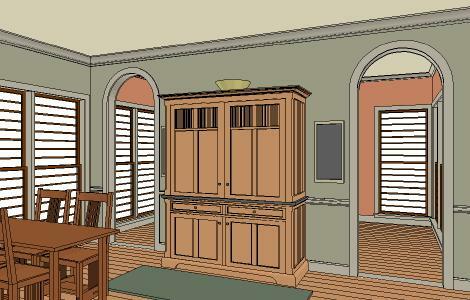 The following two images compare our smallest Kitchen Armoire with a typical exposed kitchenette. Note that the appliances and messy counter tops are ALWAYS exposed to view. 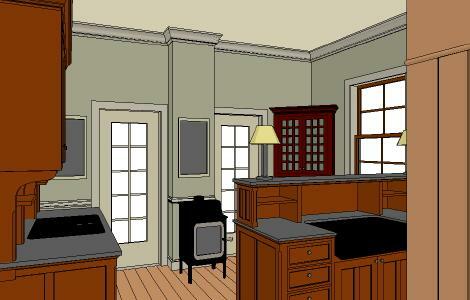 Note the wing walls, trim and soffit that are required to build-in the kitchen. The UK68B Kitchen Armoire conceals a complete mini-kitchen, messy counter tops, appliances and all. It is simple to install (and relocate). 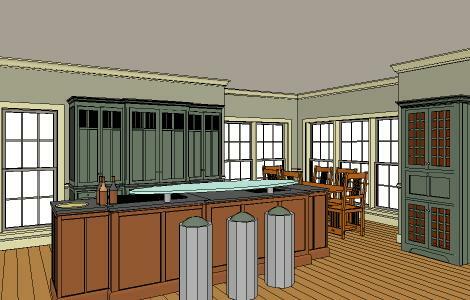 It can also be ordered as a hospitality center without a cooktop and built-in oven and can include a 600 cube ice maker. 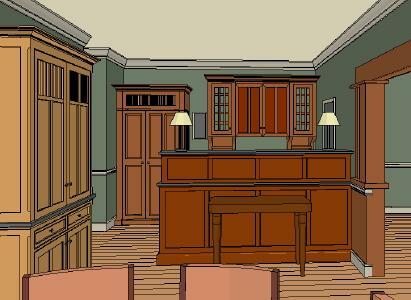 No addition construction is needed around the piece of furniture, a big cost savings. 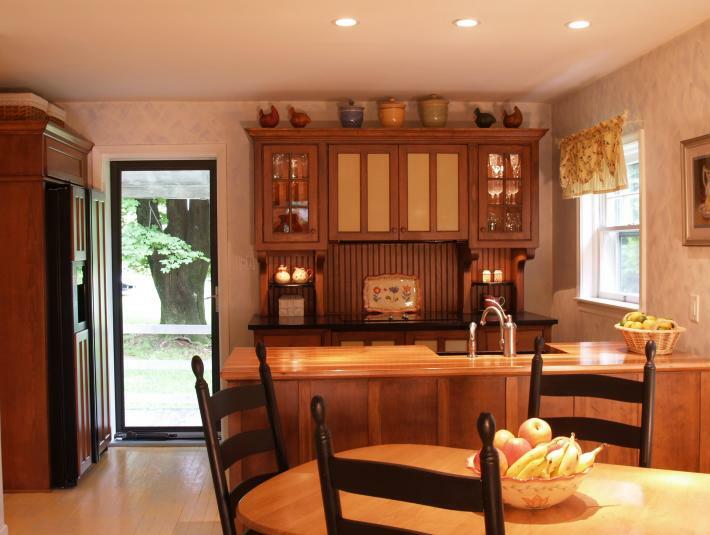 This Master Kitchen is larger than the Kitchen Armoire. It has a medium or full sized refrigerator plus everything that is included in the Kitchen Armoire plus more storage. It is great for small studio apartments, vacation cabins, extended stay hotel rooms, etc. Combining 6 pieces into two creates a very simple but efficient space saving design. The island contains the cooktop, sink and dishwasher. 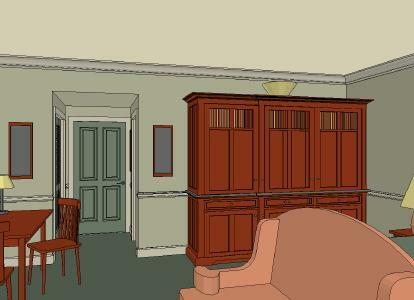 The Louvered armoire contains the ovens, refrigerator and full-height pantry. The storage unit above the island hides all the mess from the living area. The extra counter top above the island is also usable as prep space. New Loft Construction, similar to the kitchen above . This three piece gourmet kitchen includes a combination pantry, oven, refrigerator armoire; a C32 pantry (to the right); and a combination island made of 2 B18 drawer units, a S2-55U sink unit and a B40-DC downdraft cooktop unit with a custom glass bar top. Many kitchens in the 50’s and 60’s were completely cut off from the other rooms. Here the wall between the dining room and kitchen is removed. Note the shelving from the range to the corner. It is a great place for cookbooks and does not compete with the integrity of the furniture. Also the green cupboard is shorter and less deep than the refrigerator/amoire that it abuts, keeping the emphasis on the larger piece. The storage unit above the island hides all the mess from the living area. The extra countertop above the island is also usable as prep space. This tiny 3 piece kitchen ( the refrigerator/pantry is behind the camera) fits between many openings, and still has room for some shallow open shelving and a breakfast nook. This 3 piece kitchen features a refrigerator/pantry with one-can-deep shelving on either side. The storage piece above the island sink blocks the messy view from the breakfast table. The range is seen from the dining room, which is why it was important to conceal the ovens. 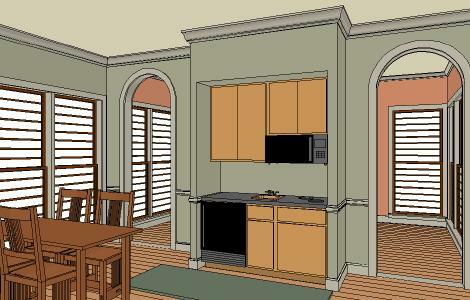 This 4 piece Period style kitchen includes a refrigerator/pantry with concealed full height 12″ deep shelving on either side (barely shown opposite the island sink). The dining area is on a sun porch through the two doors. The storage piece above the island sink blocks the messy view from the small sitting area and C32D (desk) near the stove. 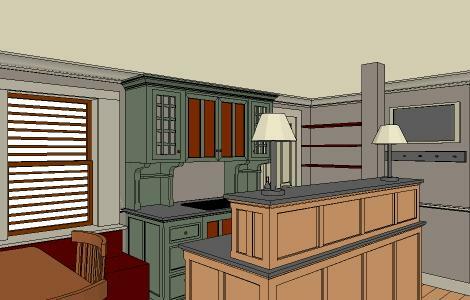 The key to making this 3 piece kitchen work is in the Working Pantry/Closet to the left concealed behind bi-fold doors. All the dry food, some dishes and small appliances are stored inside. The countertop inside is great working counter space and the shelving above and roll-out shelving below make everything very accessible. The home’s most used exterior door is next to the range, which is why the owners wanted the appliances to be concealed. This five piece kitchen includes the owner’s existing refrigerator enclosed by a pantry workstation that has side panels that open to reveal full height 12″ deep shelving. This helps to eliminate the need for top cabinets.The island range features an exposed oven, cooktop and telescoping downdraft cooktop, all concealed from view by the storage piece on top. This medium sized kitchen features 3 major workstations, a central worktable and (4) C32 green cupboards on each of the four corners. With their flip down door/worktops, each C32 can have a different function. Nearest the archway, one is a dry bar, the other is a breakfast center with the coffee maker and toaster. Another is a computer desk and the last one hides the mixer, can opener and food processor.